Recently, Rhodia Drive gave me the opportunity to play with papers by Clairefontaine and G. Lalo, two French stationers whose papers are imported by Exaclair, Inc. Clairefontaine makes a variety of notebooks and notepads as well as “Triomphe” stationery. G. Lalo makes high quality stationery for correspondence. Smooth but matte texture. Disclaimer number one: I am not an artist. I’ve been playing around with sketching people, dogs, and trees but I won’t frighten you with the results here. Still, I’ve developed a little feel for how graphite feels on sketch paper v. writing paper so I think I can speak to this a little. Clairefontaine designed GraF it to take both ink and pencil. It is less toothy than the Strathmore I used for comparison (my only other sketch paper) so it did feel as if it didn’t want to take the graphite as readily as the Strathmore. * There is some difference in the lead darkness on one v. the other (Graf it is lighter) although the paper is whiter than the Strathmore. However, the GraF it erased better and didn’t leave as much of a scar from repeated erasing compared to the Strathmore. Both smudged easily (intentionally) although it seemed to me GraF it smudged more uniformly. Whether this is an advantage or not, I don’t know. I’m sure it is because the paper is smoother overall. It’s important how it handles ink, of course, and it does quite well. Disclaimer number two: I like smooth paper but I like toothy paper, too. What I care about with paper is, will it stand up to my ink and my way of writing? GraF it paper showing pencil marks, erasure, and ink appearance. 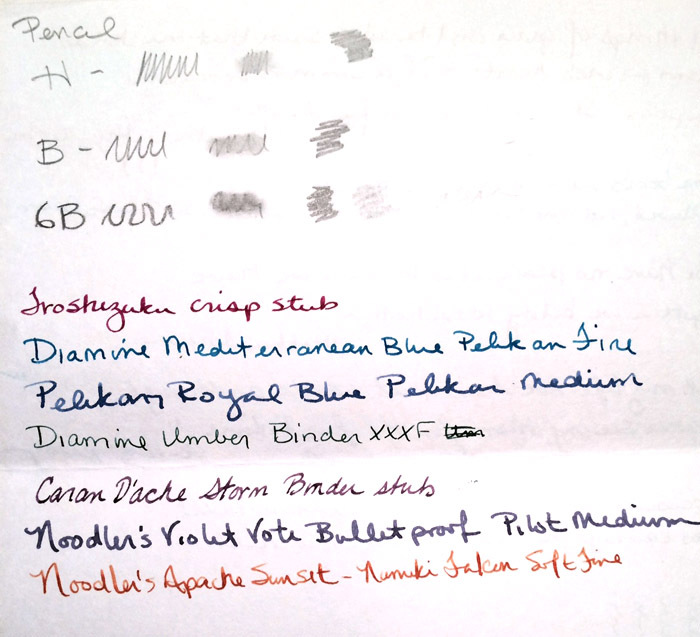 The image above shows that I used several nib types and several ink brands on the GraF it. All performed very well with no bleed-through, no feathering, and minimal show-through. As I said, the paper is matte and slightly toothy for sketching purposes but it is still fairly smooth as opposed to something like laid paper (see G. Lalo below). You’ll feel it. Your pen won’t skate like it’s oiled, but it won’t be an unpleasant writing experience. I don’t care for using pencil on the ultra-smooth paper of CF’s other notebooks (or similar papers). It’s messy and hard to control. But, I have wanted a journal I could draw in with graphite and colored pencil and fill with ink ramblings to my heart’s content. GraF it comes as blank and dot grid notepads. I was happy to learn that the same paper appears to be in their “Crok book” notebooks. On may way to find a seller, NOW! *Below is the same test written on the Strathmore sketch paper (Recycled sketch paper 400 Series) and more of my hideous handwriting. Strathmore is not designed for fountain pen ink so you can see the ink spread and slight feathering. Not bad considering. Strathmore sketch paper. Pencil, erasure, and ink test. This is CF’s correspondence paper. I’ve used the same paper but lined. It is wonderfully smooth, there’s no getting around that. I don’t know if it is exactly like their notebooks and notepads. To me, it seems a little more tolerant of my ultra-smooth nibs; they don’t seem to skate so easily. I could be imagining that. It also seems to show through a little but that could simply be that I’m not accustomed to using blank paper. Their standard notebooks are 90g just like the Triomphe paper. Whatever the case, if you want smooth paper for writing letters, this is an excellent choice and is one of my favorites. A lined version is available, as well. There is the one little problem with super-smooth paper like this: dry time. If you use a very wet pen, or a very goopy ballpoint (for shame!) you will get some ugly smearing if you don’t allow the ink to dry a few seconds. Well, in the case of the goopy ballpoint, you’re on your own. You’ll see at the end that I did smear tests for all three papers. Clairefontaine Triomphe. Top quote in wet writing medium nib, bottom quote, dry XXXF nib. Some show-through visible from other side (wet writer, dark ink). A lot of fountain pen users balk at laid paper but I’m not one of them. I love the stuff and I particularly love to use a very fine nib on it. Oddly enough, using a fat, smooth nib makes it feel more unpleasant. Better to tip toe through rocks than walk with flat bare feet on top of them. It’s more than that, however. I actually like the tactile feedback of the sharp nib on the laid lines (the narrow ridges on the paper). It’s part of the process. I equate it with the way many people prefer old mechanical keyboards over the membrane keyboards. I’ve tried to capture the lines in the picture here. Laid lines of G. Lalo Verge de France. The vertical lines are chain lines and do not affect texture. It’s entirely personal preference and if you know that your pens can only tolerate smooth or glassy surfaces, Verge de France isn’t for you. From an inky point of view, this paper was tiny bit picky. I was sent “White” which looked distinctly “cream” to my eye. Nice color but I’d never call it white. You won’t be able to tell from the pictures that the Noodler’s Apache Sunset is fainter and shows less shading on the G. Lalo than on the other papers. The darker inks were fine. My Violet Vote ink, which tends to write rather wet, almost seemed to feather. It’s not as noticeable after the fact but was when I was writing. I wrote at length on the back of the G. Lalo just to confirm my preference for fine nibs and the Violet Vote’s behavior. Yup. G. Lalo Verge de France ink test. 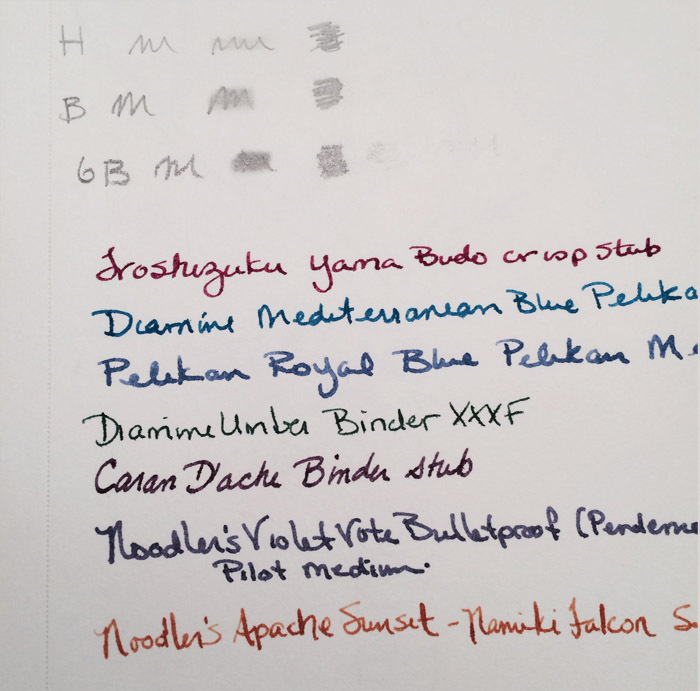 Inks used, top to bottom: Noodler’s Apache Sunset, Diamine Mediterranean, Iroshizuku Yama Budo, Noodler’s Bulletproof Violet Vote, Diamine Umber. Last image. The smear test. They all did about the same. I was surprised that the Verge de France, with its texture, smeared as much as it did. But all were good at 20 seconds. The ink is Diamine Umber in a custom XXXF nib. Umber is not known for smearing. I consider it a middle-of-the-road ink, neither too saturated nor too weak. Smear test of three papers. So, wrapping up. European paper makers come through with great stuff. No big surprise there. Is this Big Box, grade-school priced stuff? No. They aren’t ridiculously expensive either. All three are worth giving a go if you love to write letters and/or draw. Disclaimer number three: Other than three sheets of paper to play with and the fun time writing this, I get diddly squat from Rhodia Drive or Exaclair without paying for it. This little blog entry is uncompensated except by the sheer enjoyment of the process. 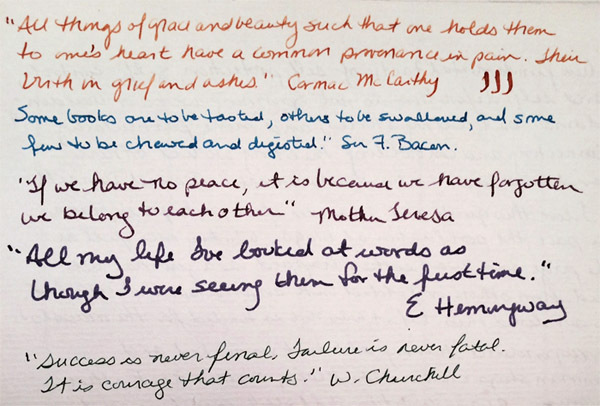 This entry was posted in Thoughts on Writing and tagged Clairefontaine, Exaclair, fountain pen, G. Lalo, GraF it, ink, journal, paper, sketch, stationery, Thoughts on Writing, Triomphe, Verge de France on November 20, 2014 by K. C. Dockal.